Walter Sanford is the guy I hire to put on seminars for my top real estate agents. His name fills the room and top Realtors thank me as they leave. His staff will do the flyer and web page plus provide the verbiage for email blasts. Walter provides cutting edge real estate systems that are easy for my real estate clients to implement. They give me the credit when Walter’s ideas increase their sales! This is the way to go to impress a large number of top producers at one time and it is affordable too. I really appreciate how Walter works my systems into his talks. All of this is very affordable…call Walter Sanford for ideas on how he can help you too! I wanted to take a moment and thank you for the wonderful presentation you recently held for us. Wells Fargo Home Mortgage is working on making its presence known in the Champaign market and your event was the start of great things to come. Your motivation and sales systems encouraged agents of all experience levels on how to perform in today’s economy. The constant endorsement of Wells Fargo throughout your presentation was a perfect touch and helped solidify our presence in this market. Since your presentation, we have met with several of the agents that attended our event and we are partnered with many of them to do business going forward. In just a few short months, Wells Fargo’s market share has increased from #5 in the country to #2. We are grateful for the energy and positive feedback you provided to each agent. I will look forward to inviting you back to another event to take our business to yet another level with the local real estate market. I want to thank you for a wonderful event in Champaign! We have received tremendous feedback from some of the local realtors. This was a great foundation for us to build upon in the Champaign market. A million more thanks for your support! 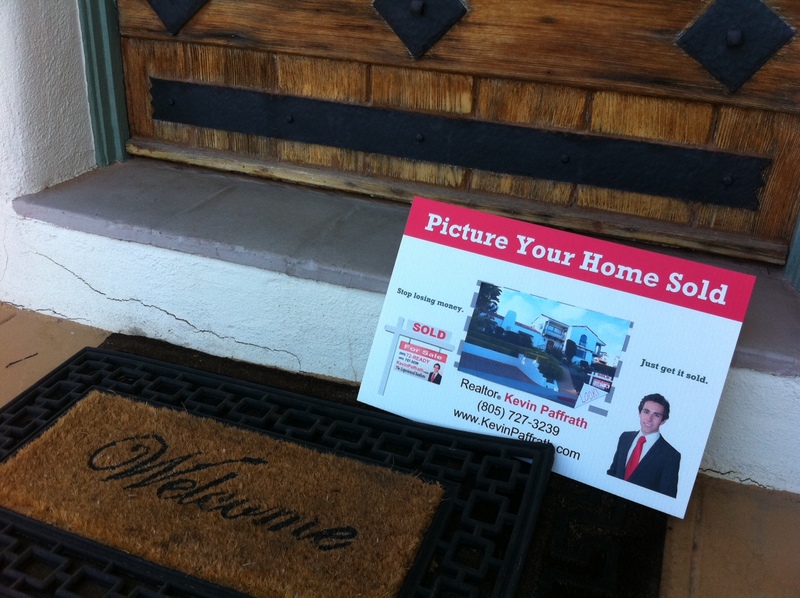 Attached is a photo from a new REALTOR® who attended our seminar. He took your idea and ran with it. Thanks for a seminar full of great ideas! Walter, you really are the greatest! I have been to many seminars in my career, I have personally spoken myself with some of the best, and I can say that you have more unique systems and ideas in real estate brokerage than anyone I have ever seen. The agents who attended were all the best of the best, and they walked out with copious notes and promises of implementation. I received credit for the seminar and built many new relationships. In fact, after your soft-solicitation of obtaining loans for me, I have new transactions. In addition, I have agents calling to meet with me about doing business together before I even had a chance to follow up with them after the seminar. This seminar is in the black for me. I have been doing loans for 21 years and find that when you are a well-known loan officer, additional loans start coming at additional costs. This was one of the most cost-effective ways to affect the careers of the top agents in my area and get in front of top producers all at once. The thank you’s are still coming in! You kept my attention and theirs every minute. It was all money well-spent! Shashank Shekhar: You were awesome at our event yesterday. In less than 3 hours, you taught so many amazing ideas that if implemented could change the business & lives of the attendees. We look forward to having you here again! Got2BSocial: …It (the seminar) was outstanding! WOW, Walter was on fire! I have ideas for the next 5 years. Time to implement….Walter cranked out the juice. Lots of ideas on how to prospect and smart ways to market. Hilda Ramirez: Thanks for the great program, Walt! Heck, I got so entrenched in the info and so inspired that I almost ran out to get licensed so I could start doing deals! Can’t wait for you to come back to Cali. If you would like more testimonials, references, or unique ways to market your event, please call us at 815.929.9258 for a personal consultation. I thought I’d take a minute to say thanks again for the seminar, education, and skills that you were able to come and share with the Realtors® in my area. As a Lender, I’m always looking to bring something new to the table to those [Realtors®] in which I’m trying to build relationships with. They were all very grateful and thankful for the strategies that you were able to come and share with them to help them take things to the next level. I have since heard from them even more ‘thank you’s’ as I’ve been following up with them telling me that it was the best and most informative seminar that they’ve ever been too! This is coming from GRI, CRS, ABR realtors® ! One of the beauties is that I got the credit for providing them the class as a reference to go to when they need help in their business!!! I would be more than willing to have you come again for a Round 2. I gave up a good cooshy job to make a run at working in the mortgage industry. I’ve pretty much lost my shirt and have been sending out alot of resume’s wondering what to do. I signed up for the free webinar being given by yourself and the mortgage press and had no idea who you were. When I saw Sue Woodad was going to speak I signed up and clicked on your free video. That 10 minute video inspired me to dust myself off, get up and create a strategy for success. When you said you were 1.7million in debt at one point; that type of honesty made me realize that I can get out of the mess I’m in. I don’t even know if you’ll read this but if you do THANK YOU. I’m getting out of a forclosure mess that no one but me put me in and watching your video has been encouraging. I look forward to your seminar. Thanks, Michael E.
Thanks again for facilitating our Realtor® seminars February 4 & 5, 2008 in Calgary and Edmonton. By the positive reactions from both the attending Realtors® and our RBC Mortgage Specialists, we let far too much time pass between you and RBC working together. Your experience and knowledge of real estate markets is something all our attendees truly valued. Your disciplined, structured and easy to implement sales routines and systems will make us all more effective and efficient sales people. Walter, I’ve had nothing but positive and favorable reviews about your presentations from the Realtors® who attended. What I also find so valuable and interesting is how all your systems are so applicable to the mortgage and home equity home financing business that RBC is involved in. I can’t begin to tell you how many of our RBC specialists have committed to implementing your sales systems and processes. Your seminars allowed RBC to give something back to our valued business partners in the real estate industry. We’re all sincerely appreciative of this. In closing, many thanks for your great, entertaining facilitation skills and professionalism. We definitely won’t let so much time pass before we work together again. Thank you so much for your spectacular presentation at our event last week! Your energy level and knowledge are what made it a very successful event for us! Thanks again for a GREAT two days with us in Vancouver . We ended up with over 400 Realtors at both events…..your name really drew them in! Our Mortgage Specialists received a ton of excellent feedback and thank you’s to Royal Bank from their Realtors who attended. From our standpoint, we were very impressed by the way you showed the Realtors how they could partner with their Royal Bank Mortgage Specialist to refer business back and forth. I had Realtors coming up to me after the sessions asking me how they could get started with one of our Mortgage Specialists. A number of new realtor contacts have been made. Having your Mortgage Specialist seminar after the realtor session the same day really made sense. It tied the two groups together nicely in that both our Realtor contacts and our Mortgage Specialists were excited and ready to DO a lot of the things you talked about. The Mortgage Specialist day really helped our new people get motivated to approach the “Elephant Agents” with renewed confidence too. Overall, it was an invaluable two days for our Royal Bank Mortgage Specialist team. Jason Lash, Family Home Lending Corp.
“…We brought Walter Sanford into Grand Rapids to speak to every REALTOR® we could get our hands on. The seminar was 3 hours long with a 10 minute break. He covered many topics but focused on how to manage investment properties, manage your contact database, properly run open houses, gain new buyers by using your current listings, how to find the motivated sellers and not people that just want to list, and how to use your title agent and mortgage broker as unpaid assistants/sales force, and the real estate team concept. He had a ton of energy and was extremely motivational. Prior to him speaking, he was out mingling with the crowd. During the break and after speaking, he was managing a table with all of his books and marketing material which he was selling at a discounted price. I am familiar with his stuff, and it is all quality material. I am guessing that about 75% of the REALTORS® purchased something. …The tickets we passed out were free to the REALTORS® (no value to satisfy RESPA), and the title company printed them for us at no cost. I split this event three ways with a title company and an insurance company. I also think this would be perfect for home inspectors or a home warranty company, but we didn’t approach them. There where a few mistakes made regarding our REALTOR® presentations and RSVP processes, but we have learned from those mistakes. If we spent more time marketing the event and avoided doing so during the holidays, I think we could have easily had 100 REALTORS®. At the end of the seminar, Walter asked everyone to hold their hands up if they got at least one good idea. He then asked them to keep their hands up if they could commit at least one loan to me within the next 60 days plus one title order to my title company sponsor. He then asked those people to write an “M” on the back of their cards if they will send me one deal and a “T” if they will place an order for a title policy. I walked out with 21 cards with M’s on the back of them. In 24 hours, I had 2 purchase agreements already and 4 appointments with new REALTORS® in the following week. I also had 3 REALTORS® call me up and thank me for inviting them. My name is Corine Hatfield and I was at the seminar in Fresno on September 28th. I’m a loan officer with Royal Charter Mortgage and I have to say that I have been to many of these type seminars in the last 10 years and I only went as a last resort because frankly, I’m not very busy now…..ugh! I have to tell you that I found this seminar to be the quickest 3 hours I have ever attended. I was captivated and I learned a lot. Some of the ideas I’ve come up with on my own and some were new to me. I, like you, try to stay 5 steps ahead of the competition and have for 10 years. I was very impressed with your wit, knowledge and systems. I’m like you in a lot of ways, outgoing personality and I don’t really hold back with my clients. I love to make them laugh and we have a great time and all walls come down after my first meeting, so you were very refreshing to me. Usually I’m gone after the first hour at any seminar…..so kudos to you! Thanks for the great start of my day. Adolph Collaso, South Pacific Financial Corp.
Hi Cyndi! The event was a huge success! Walter was awesome as usual. He always seems to have his finger on the Real Estate Market pulse and delivers an educational yet entertaining program. Real Estate agents in the area are raving about the event! Many of them have said that they have never been to a seminar such as ours in the High Desert , ever! Thank you for all your help and I look forward to the next event. You guys are the Best! If you’re looking to boost your business and attract top agents to work with you — Walter is hands-down the best speaker for your event! His intimate knowledge of the affiliate dynamics plus the real world, moneymaking ideas he shares will have your agents eating it up and begging to work with you! It’s been just one week since my event and so far, I have six appointments with agents and $1.2 million in loans already in escrow! In conversation with one of the agents in attendance, she stated that she looked at her watch and couldn’t believe that three hours have already passed. Walter kept the crowd involved and focused for four hours. I had many conversations with the attendees during the morning and many stated that they couldn’t believe how hard he worked and gave of himself to present all the material that he did. Everyone laughed, learned and enjoyed to entire morning. I am very happy that we, at National City Mortgage, decided to partner with Walter over the last ten years. Thanks for your great talk today on new prospecting ideas. Your passion came blasting through. It’s easy to see why you have separated yourself from the crowd, both agents and other real estate industry speakers! You are definitely operating on a different level than 99.93% of all the REALTORS®, loan officers, and others surrounding our business. What’s most interesting, though, is that you make it so easy for people like me to do the same. Thank you, again, for your enthusiasm and love of this business. My sales team has already employed some of the sales strategies you presented. I will keep you abreast of the success we achieve as a result of those strategies being properly utilized. Your emphasis on relationship selling mirrors Norwest’s philosophy. It was great that our sales team heard it from such a high-powered real estate professional. My thanks again. Best wishes and continued success. Thank you for your participation as a speaker during WAMB’s NW Wholesale Lenders Conference that was held on October 14th. The event was a “huge success” with over 1,200 attendees and 130 exhibitors. Everyone from the board of directors to the coffee cart servers commented on the tremendous amount of energy and excitement. Again, we thank you!